This site is a labor of love, and it always makes my day when a writer tells me one of the articles helped them through a tough problem or got them over a writing hurdle. It's why I do it, and why so many of my fellow writers do it--the writing community is a wonderfully supportive group. 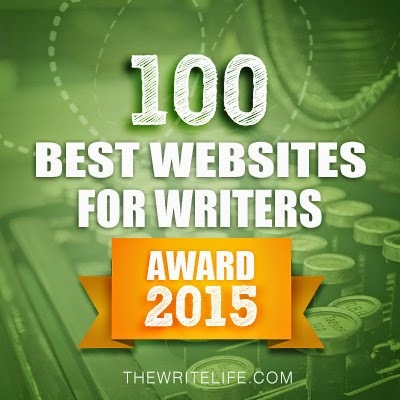 So it made more than my day to find out that the site made this year's list of The Write Life's 100 Best Websites for Writers. I'm honored, flattered, and touched. It means a lot to me. Thanks so much to everyone who recommended me, and to everyone who comes here when they need a little writing help. You guys are awesome. Congrats Janice!! Your site continues to be one of the most helpful I've found. Way to go! Much appreciated :) I don't mind lurkers at all, you're always welcome. Three Cheers, Janice. This site is very helpful. Whether I get to post a comment or lurk-and-learn, your site offers a great deal for writers. Thank you :) It's funny, as I never know which article will get responses. And it's never the ones I expect, lol. Congratulations - and very well deserved. You've educated and enlightened through your generosity and natural gift for teaching. So many 'Ah-Hah' moments from your blog...kudos on the recognition. Aw, thanks so much. I love when those Ah-Hah! moment happen. Great way to start a new year -- Congrats and YAYYY! Now I expand that to say: "thank goodness you share your passion for writing with us!" Thanks, I think so too :) Sharing is my way of paying back all the folks who have helped me over the years and never even knew it. Proud to say you got my vote. Congratulations. You deserve it. I knew I had good taste!! Congratulations. Well earned. Congrats, Janice. You so deserve it. And I was thrilled that Literary Rambles made the list too. I know what you mean. Blogging is a labor of love. I saw, grats to you guys, too. I saw so many friends on the list, it was awesome. A labor of love indeed. You and your site deserve the award! In fact, I'd place you in the Top 10 Sites for Writers. Nice! Good things happen to good people. That's great news - congratulations! Any time a new writer asks me for advice or critiques, I send them here. Thank you for all the work you put into this blog - it's a tremendous resource! You are most welcome, and thanks so much for sending writers my way. My dream when I started it was to become a resource for writers, so it does my heart good to hear that. Much deserved! This is seriously not only the best writing blog I've ever found but the best blog for developing ANY art form hands down! I long for the day I find a blog that's on par with this one for my other hobby (drawing). Keep it up! Well deserved. It makes my Top Ten. Thanks, Janice. Congratulations. You definitely know how to give practical, actionable advice, and I'm glad whoever created that list sees that. Keep it up! Thank you! I do enjoy doing it. Working with writers is so much fun. You totally deserve it! I've learned so may things from your blog. Keep up the good work! Thanks so much! That means a lot coming from someone who's been reading also since the beginning. Congrats! Well deserved. I love your posts, always insightful and helpful.